During one of our recent cottage meetings, part of our conversation turned to the North Rose that exists only in memory: the drug store, a grocery, a bank, the movie house. No one mentioned the Knotty Pine Restaurant, the folks who came to eat there, the community networks that were maintained there, the town business conducted informally at those tables. All those places are gone now, a loss mirrored in small towns and villages all over Wayne County and around the country, and in large cities, too. In Buffalo, people still feel the absence of the steel mills that once lined the lakeshore. In Rochester, it’s Kodak; in Schenectady, locomotive manufacturing. In Union City, New Jersey, where I began my parish ministry, people still recall the embroidery industry that once flourished there. Churches, too, are in decline. Last week I learned of plans to close the Episcopal church in Lyons by the end of the year. The way things are going, we may soon be the only congregation of any denomination left in northern Wayne County served by a full-time pastor. We look at signs of hope in other places. The United Methodist Church of the Resurrection in Leawood, Kansas, for example, just announced plans to build a larger sanctuary with a price tag of $90 million. And we might wonder if revival will ever visit us, if those glory days of old will ever come again. Jeremiah wrote his letter to exiles in Babylon who, like us, had lost the life they once knew. They were caught in forces of social change and geopolitical shifts of power most of them couldn’t understand, much less cope with effectively. They were homesick for the old days, the old ways. They had hopes and dreams that one day they might recapture some of their former glory, but there was no telling when, or if, that might happen. In the meantime, Jeremiah wrote, settle down where you are, and make for yourselves as good a life as you can. Build homes for yourselves, make a living, marry and have families. “Seek the welfare of the city where I have sent you into exile, and pray to the Lord on its behalf, for in its welfare you will find your welfare” (Jer. 29:7). Your old life is gone, he said, and your new life is to be found in the place of your exile and captivity. Deal with it. Settle down. Adjust! Dr. Phil couldn’t have said it more bluntly. It’s a message for any of us who face a disappearing past and an uncertain future: those who lose their employment when their company downsizes; new parents whose freedom and personal time are lost to the demands of parenthood; people preparing to retire and move from a life in the workplace to a life they’ve never known before. It’s a message for a congregation in transition from one long-term pastor to a future where the only certainty is change. Jeremiah’s message was radically practical and surprisingly new. Rather than resist what’s happening to you, he advised, cooperate with it. Rather than resent your situation, accept it and accommodate yourself to it. Rather than reject your new reality, embrace it, settle in, and become productive. Mourning the past and yearning after it will not make it reappear. Instead, Jeremiah challenges the Jews in captivity, as he challenges us, to embrace the place where life and God have brought us. Find ways to be faithful in our living right where we are. 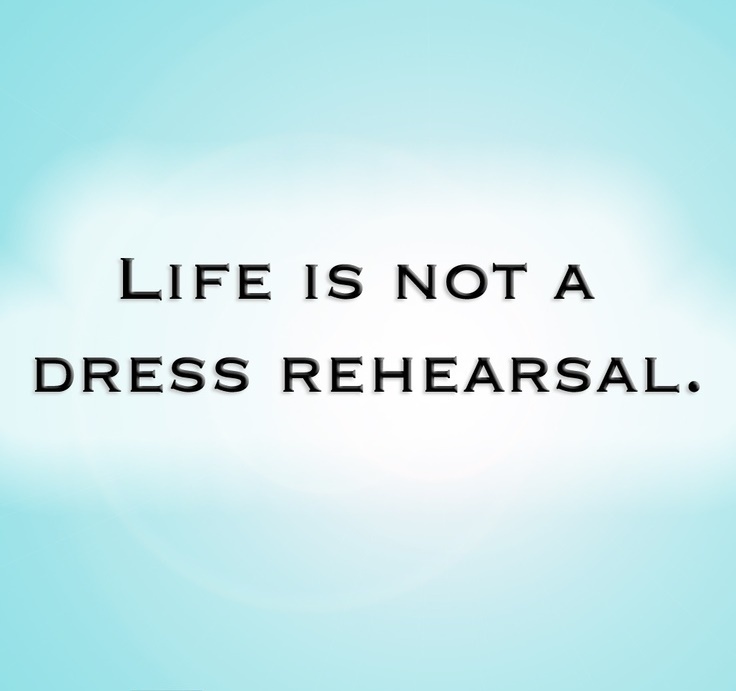 Someone said, Life is not a dress rehearsal. Our faith is not about preparing ourselves to live a better life in the future, especially not one after death. Our faith is about how to live this life well and fully. We don’t get a second chance at it; the more and better life Jesus offers is now or never (cf. Luke 14:15-24). Because this is not a dress rehearsal, the choices we make about how we spend this life are critical. Here are some of the choices one life coach I know identified. ▪ Do we putter away at meaningless activities, or do we live with purpose? ▪ Do we choose to be controlled by our fears, or do we act with boldness? ▪ Do we squander our talents, or do we make the most of our potential? ▪ Do we spend our days complaining about life, or do we identify a multitude of reasons to be grateful? ▪ Do we wait to be chosen, or do we choose ourselves? ▪ Do we live on a treadmill, or do we make progress towards meaningful goals? ▪ Do we keep saying, “One day I will,” or do we make today the day that we do? ▪ Do we live self-indulgently, or do we make a positive difference in the lives of others? ▪ Do we wait for something to happen, or do we make it happen? ▪ Do we criticize the efforts of others, or do we become the person in the arena?